The Federal Open Market Committee (FOMC) of the Federal Reserve has just adjourned its first, regularly scheduled monetary policy meeting of 2008, and, in accordance with the latest forecast, the FOMC has just lowered its target for the Federal Funds Rate by 50 basis points (0.50 percentage point) to 3.00%. Therefore, as of today, the U.S. Prime Rate is now 6.00%. Many American banks have already issued a press release announcing that their prime lending rate has been lowered from 6.50% to 6.00%. "The Federal Open Market Committee decided today to lower its target for the federal funds rate 50 basis points to 3 percent. In a related action, the Board of Governors unanimously approved a 50-basis-point decrease in the discount rate to 3-1/2 percent. In taking this action, the Board approved the requests submitted by the Boards of Directors of the Federal Reserve Banks of Boston, New York, Philadelphia, Cleveland, Atlanta, Chicago, St. Louis, Kansas City, and San Francisco." As of right now, the investors who trade in fed funds futures at the Chicago Board of Trade have odds at 67% (as implied by current pricing on contracts) that the FOMC will vote to lower the benchmark Federal Funds Target Rate by 25 basis points (0.25 percentage point) at the March 18TH, 2008 monetary policy meeting. The economy grew by 0.6% during the fourth quarter of 2007, according to the "advance" estimate released by the Commerce Department this morning. Wall Street economists were expecting around 1.2%. 0.6% growth is certainly slow enough for the Fed to cut aggressively, as expected. The odds that the Fed will cut short-term rates by 50 basis points (0.50 percentage point) are currently at 74%, while odds on a 25 basis point cut are at 26%. The decision on interest rates will be released in less than one hour. Stay tuned. As of right now, the investors who trade in fed funds futures at the Chicago Board of Trade have odds at 100% (as implied by current pricing on contracts) that the FOMC will vote to lower the benchmark Federal Funds Target Rate by at least 25 basis points (0.25 percentage point) today. The Fed will make its next decision on short-term interest rates on January 30, and as we approach that date, the odds from the fed funds futures market have, with increasing confidence, been predicting that the Fed will opt for a 50 basis point (0.50 percentage point) cut. The odds on a 50 basis point cut for the benchmark Fed Funds Target Rate now stand at 78%, and the remaining odds -- 22% -- are for a 25 basis point cut. Let's have a quick look at what might have influenced the futures market recently. Though both the Dow Jones Industrial Average (DJIA) and the S+P 500 Index advanced on the week, both indexes are still down significantly since each peaked last fall. Since closing with all-time highs on October 9, 2007, the DJIA is now down 1,957.36 points (13.819%), while the S+P 500 is down 234.54 points (14.985%). The yield on the benchmark 10-Year Treasury Note fell to 3.584%. For some perspective, the yield was 4.65% on October 9, 2007. Also notable: New York Spot Gold closed at $910.50 per ounce on Friday. There was good news from the distressed financial sector this week: Bank of America is buying mortgage-origination behemoth Countrywide Financial. Countrywide, which is the nation's #1 home-loan lender, has taken a beating in the wake of the subprime mortgage crisis, and there were rumors that the company might file for bankruptcy. But the good news about Countrywide wasn't enough to keep the stock market from losing ground this week. In fact, since closing with record highs on October 9, 2007, the Dow Jones Industrial Average (DJIA) has lost 1,558.23 points (11.0%), while the S&P 500 has given up 164.13 points (10.487%). On Friday, New York Spot Gold crept closer to the $900 mark, and the yield on the 10-year treasury note fell to 3.81%. Right now, the fed funds futures market thinks the economy is looking bad enough that the Fed will take aggressive action when the Federal Open Market Committee (FOMC) releases its decision on interest rates on January 30. 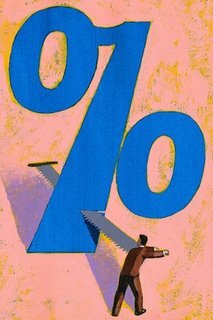 The odds that the Fed will cut the benchmark Fed Funds Target Rate by 50 basis points (0.50 percentage point) are currently at a very confident 100%; the market is also betting, at 34% odds, that the Fed will either cut rates before the January 30 meeting, or they will opt for a 75 basis point cut at the end of the month. Those are some pretty intense odds. Nonfarm payrolls advanced by 18,000 during December 2007, according to this morning's Labor Department report. 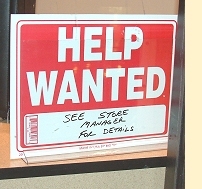 Wall Street economists were expecting around 70,000 new jobs for last month. News that the unemployment rate jumped from 4.7% to 5.0% also surprised economists, many of whom were expecting the jobless rate to come in at 4.8%. The investors who trade in fed funds futures reacted to today's employment report by raising bets that the Fed will opt for an aggressive cut on January 30. The futures market is still 100% certain that the Fed will lower the benchmark fed funds target rate at the end of the month; the odds on a 50 basis point (0.50 percentage point) cut are now at 68%, and the odds on a 25 basis point cut are currently at 32%. Wall Street reacted bearishly to today's jobs report: the Dow Jones Industrial Average (DJIA) fell by 256.54 points (1.96%), the NASDAQ Composite lost 98.03 points (3.77%) and the S&P 500 declined by 35.53 points (2.46%). The yield on the 10-year treasury note fell to 3.854% and New York Spot Gold closed at $863.00 per ounce. As of right now, the investors who trade in fed funds futures at the Chicago Board of Trade have odds at 100% (as implied by current pricing on contracts) that the FOMC will elect to lower the benchmark Federal Funds Target Rate by at least 25 basis points (0.25 percentage point) at the January 30TH, 2007 monetary policy meeting.